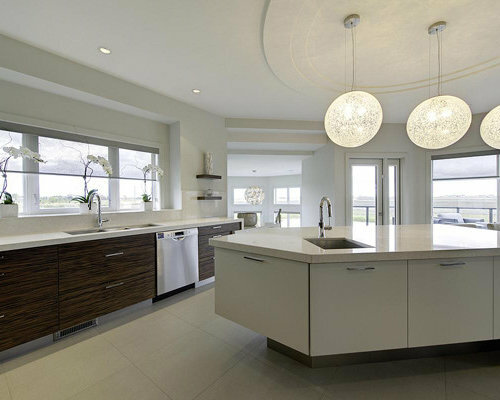 We designed this new 6,000 square foot home in the Bridgewater Forest suburb of Winnipeg. Situated on a large man-made lake, the design of the home radiates around a central curved staircase. 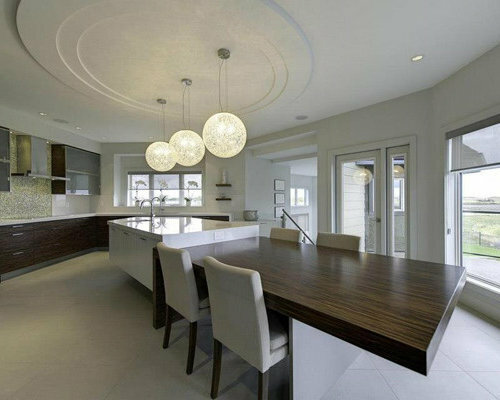 Curved forms subtly repeat throughout the home. Great Room with concealed TV above fireplace Gerry Kopelow/Photographics inc.
Great Room open to above, Artwork by Roger LaFreniere Gerry Kopelow/Photographics inc. The double volume great room is the center of the home with wood floors, exotic wood panelled walls, large fireplace, large windows and a balcony from the 2nd floor hall. Powder Room Gerry Kopelow/Photographics inc. Dining room with a modern buffet with back-lit shelves. 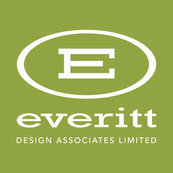 The organic pattered wallpaper is deep charcoal and medium gray and is absolutely stunning. 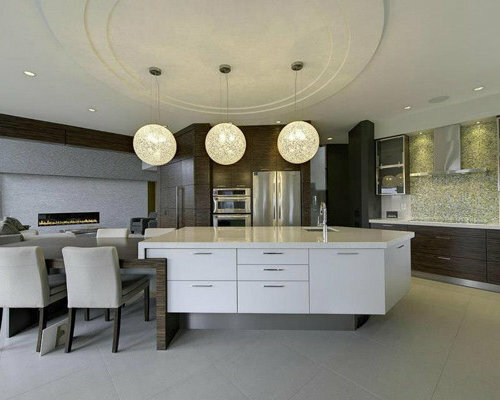 Kitchen with large center island, large hand-blown glass light fixtures, exotic wood cabinets and curved ceiling details. 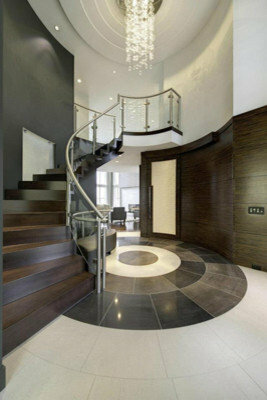 Entry foyer featuring the curved wood staircase, wood panelled walls and patterned porcelain tile floor. 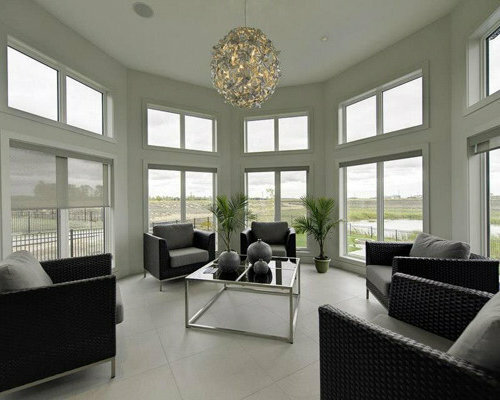 Sunroom off the large kitchen. 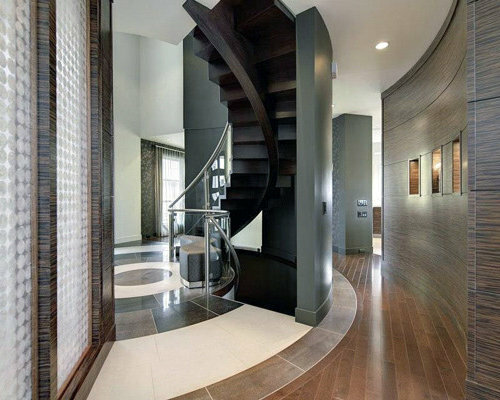 A curved hallway behind the circular staircase into the entry into the home. 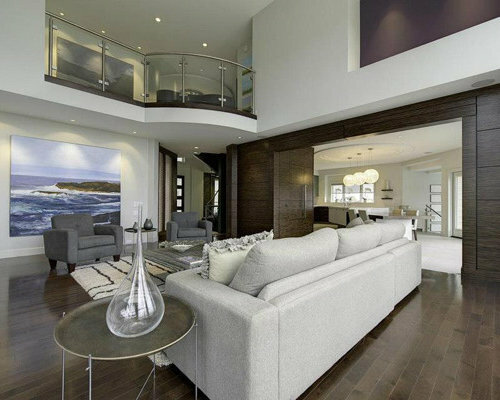 Wood paneled walls and decorative acrylic screens add texture and drama to the space. 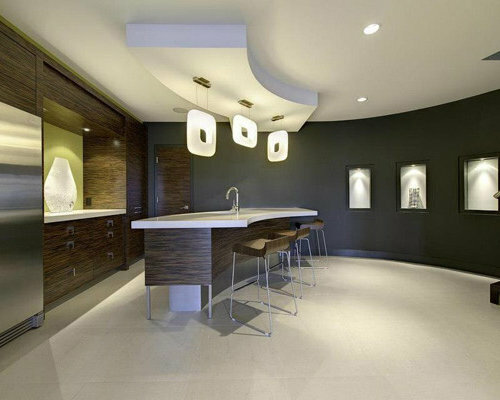 The lower level features a curved bar with sink, fridge, dishwasher temperature controlled wine room and pantry space. 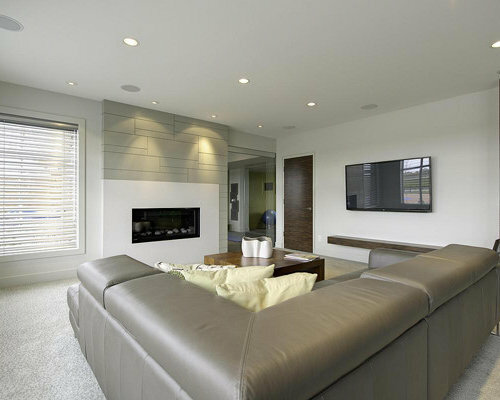 Lower Level seating area with fireplace and wall-mounted TV. 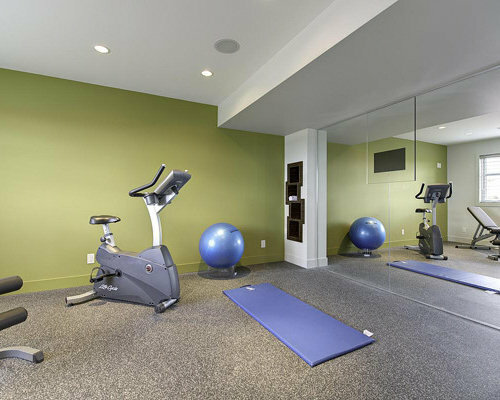 The home gym can be seen through the glass door to the right of the fireplace. Home gym with TV back-mounted behind the mirrored wall. A cozy master bedroom featuring deep purple walls and gray carpeting and bedding. Suspended lamps on either side of the bed create interest while allowing the entire night table surface to be utilized. 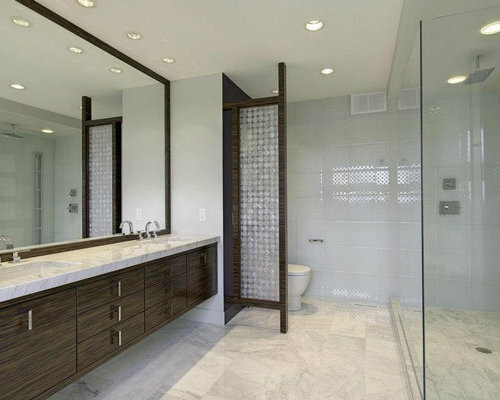 Ensuite Bathroom with marble floors and counters. 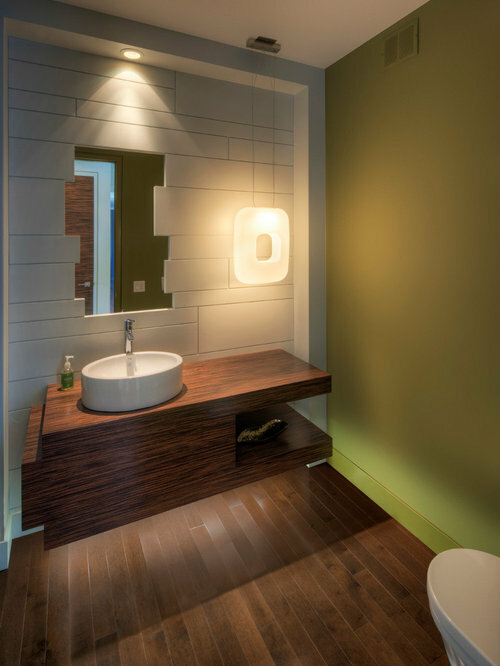 Wood accents and the acrylic toilet screen give warmth and interest to the space. 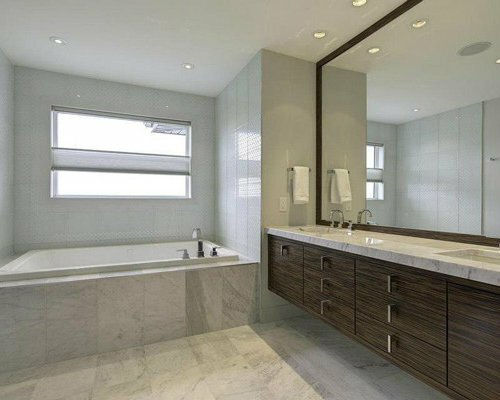 Ensuite Bathroom with marble floors and counters. Wood accents give warmth and drama to the space. 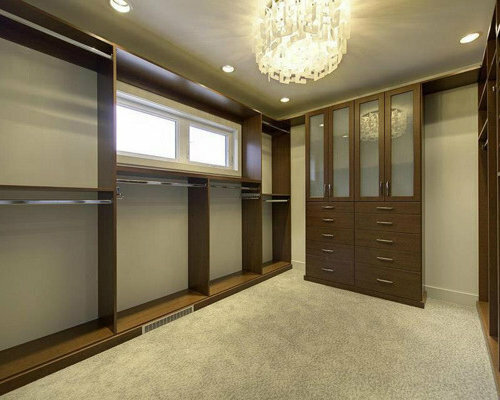 Walk-in master bedroom closet with wood cabinetry. 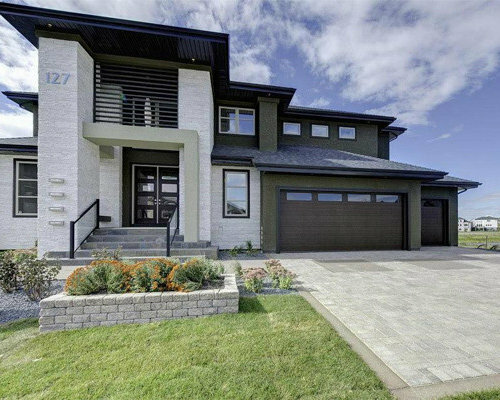 Front exterior of the home features white stone and dark acrylic stucco. 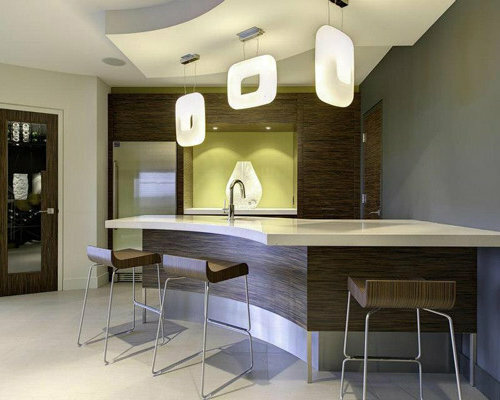 The Asian-inspired entry is highlighted by a horizontal metal screen and suspended light fixture. Rear exterior of the home showing the walk-out lower level, balcony from the main level, pool, firepit and sports court. 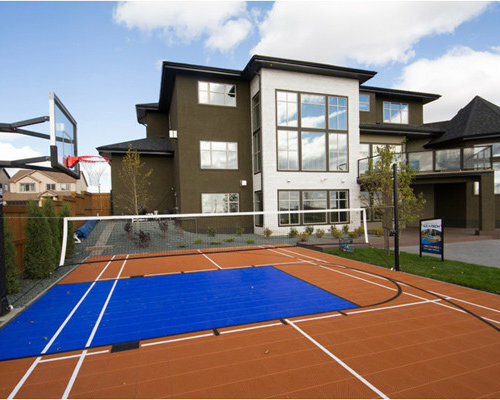 Rear exterior of the home showing the walk-out lower level, balcony from the main level, firepit and sports court.